If you think that teenagers don’t have any money to manage, think again. U.S. teens earn about $91.1 billion annually. A 17-year-old makes, on average, $5,000 per year. However, only 38% say they are currently saving. That could be because there are actually a lot of things for teens to spend that money on. For example, the average cost of owning a car is $8,698 per year. Just going to prom can set a teenager back about $919. 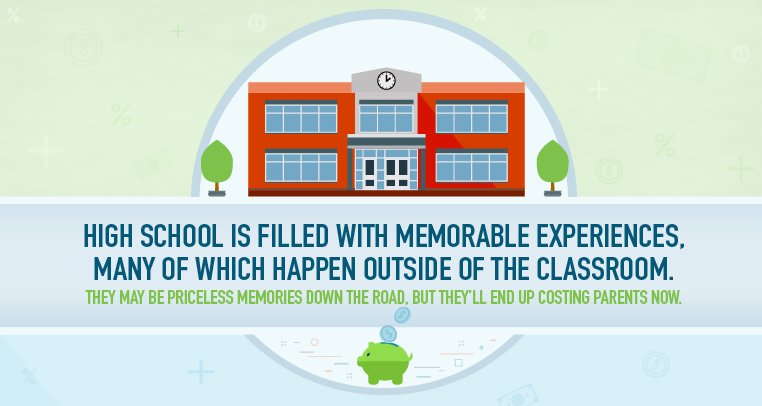 This infographic from the H&R Block Dollars and Sense blog breaks down a number of costs that teenagers – and their parents – incur during high school. We think it’s important that teenagers learn how to manage their income, budget for expenses and save for things like their education. That’s why we offer the H&R Block Budget Challenge. High school teachers can enroll their classes in this online simulation where students encounter real-world personal budgeting situations, problem-solving, decision-making and accompanying lessons that meet national standards. The perk is that the best performing students can win scholarship money. In the 2015-16 school year, H&R Block will award 132 scholarships worth $20,000, 60 classroom grants for $5,000 and one grand prize scholarship worth $100,000. Last year’s winners have inspired us in so many ways, and it is exciting to see the futures they are crafting with the scholarship winnings. Emma Fancher was awarded $20,000 and is now attending the University of North Alabama where she majors in secondary math education. “Growing up in a household with a single mother and a sister with special needs, I was told from a young age it would be up to me to pay my way through college. So the $20,000 scholarship I won from the H&R Block Budget Challenge has ensured that I can go to my first four years of the University of North Alabama and come out debt free, which is something I’m so grateful for,” she said. Read more about Emma and her Budget Challenge experience. Whether you want to learn more about money management, or want to help teach your teenager, our H&R Block Dollars and Sense blog is a wonderful resource. You might even be surprised at how much you don’t know! Case in point: check out this video where we stumped teens and adults about financial terms. Do you think it’s important to teach financial topics in high school?